SFW205GPC Digital Fire/Water Safe is rated 4.3 out of 5 by 105. The SentrySafe SFW205GPC provides reliable protection and organization for your important documents and valuables. 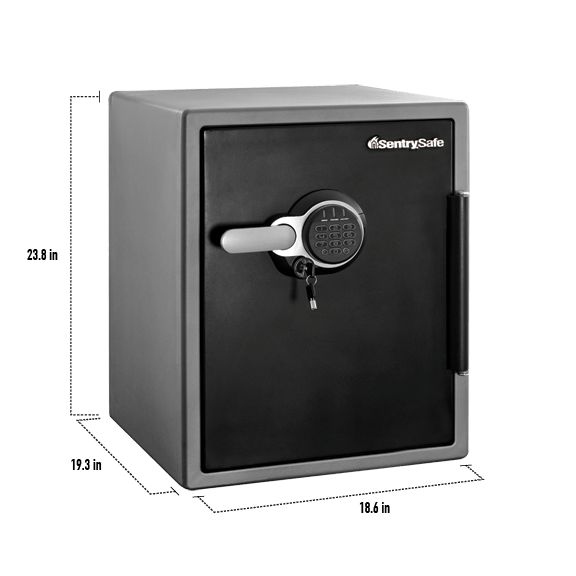 Dual digital lock with key, solid steel construction, and live locking bolts offer versatile security you can depend on. 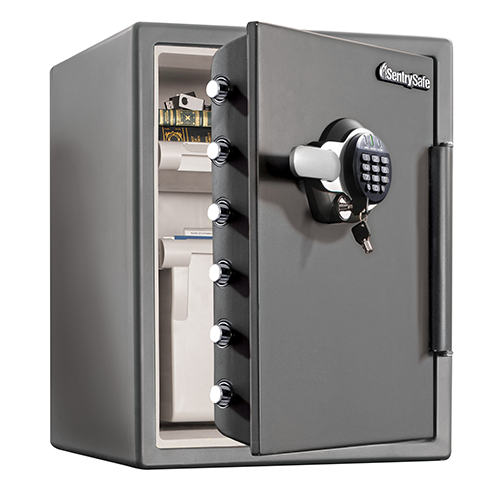 Complete with a deep flexible drawer for organized storage of letter-size hanging file folders to the smallest of valuables, this safe is ideal for all your home and office security needs. Rated 4 out of 5 by Richard Z from Does the job! So a lot of reviewers complain about the moisture, the poor locking mechanism etc... I think the safe is an excellent value.. it allows us to keep some valuables and necessary papers etc in a safe environment.. the safe is weighty enough that someone would have a difficult time walking off with it.. We actually have this in the corner of my home office with a lamp on it... an end table use!.. we just need more room then a strongbox but not as large as a refrigerator! Love the fact that there is a drawer, it’s lighted , and compartments for passports etc.. don’t forget to use desiccant... all safes need it! Rated 1 out of 5 by trouble_343 from Strong and secure safe I hate this safe. You have to have laying on its back and you have to actually physically be on the safe to be able to get it open.The safe is not made properly and the pins in it are too tight. SOMETIMES you can get it open that way or get it closed. Right now it is sitting in the middle of my living room being used for absolutely nothing until I can find a place to get rid of it. For the overall rating I had put one star because it wouldn’t take no stars. Rated 4 out of 5 by MKSculptor from So Far so good! We've only just set it up but the positive to that was that you had good videos and it was very easy. It's a nice size and when we took out the file holder we gained a lot of space to put in 2 "quick exit" back packs filled with important documents etc BUT REALLY--YOU SHOULD ASK FOR A REVIEW A FEW MONTHS NOT A FEW DAYS AFTER GETTING THE SAFE. I can only give a quality rating after a couple days with it. Rated 1 out of 5 by paulC44 from Questionable safety I am very apprehensive about this safe. 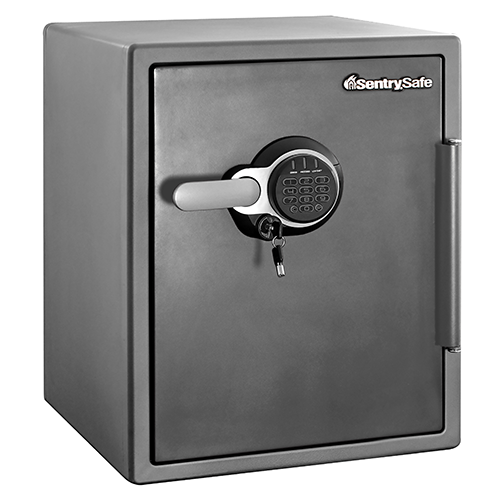 I had to dump the previous model of this safe (2002) model because the lock became unreliable. But the previous model had two covered drawers and a sliding compartment for documents. This model only gives you a document bucket and one flat drawer. Cost cutting. The previous lock opened very smoothly when it worked. This one is so hard to open because the mechanism is binding all over with uneven parts. There is no confidence that it will open again. Rated 5 out of 5 by JLOchoa from Been eyeing this safe for a while.... Heavy and solid. Easy to use and roomy enough for my stuff. I ordered an additional shelf and the locking box to keep stuff better organized. Keypad is big enough to prevent miss keying combo and having to start over (issue on a couple of other brands I looked at) and was pleasantly surprised that there was an LED light inside (over looked that feature in my research). I got lucky and while I had already found a great price through Amazon - my local Costco happened to have the same item for much less. Very happy so far! Rated 4 out of 5 by Req42904 from Strong safe, but with questionable security According to the manual, the 5-number factory unlock code will always unlock the safe, even if user codes are entered to supplement it. Therefore, if the factory unlock code is compromised in any way (like with loss or photocopy of the user manual), then security of the safe becomes entirely dependent on access to the physical unlock keys. Better that the user should have the option to retain or replace the factory unlock key when creating a user-defined key.